Cry ‘Havoc’, and let slip the dogs of war—as Shakespeare’s Mark Anthony so famously said. Seventy-one years ago today, the United States Army did exactly that. 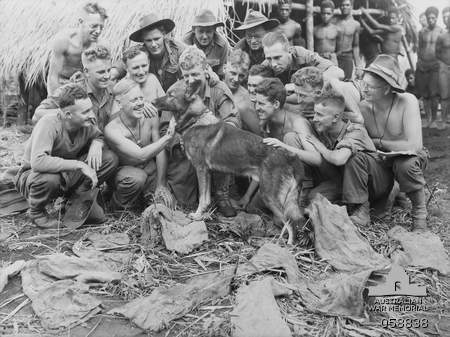 On 13 March 1942, they began to train dogs for the War Dog Program, the ‘K-9 Corps.’ It has been suggested that 13 March become National War Dog Veterans Day. (The idea has already been accepted in New Jersey, where it received the blessing of the state legislature). The use of war dogs goes back to ancient times. In the United States, the idea was abandoned after World War I, but reintroduced during World War II in the Army, Navy, Marines and Coast Guard. The pictures of Sandy—who was perhaps named after Little Orphan Annie’s dog—were taken in New Guinea. 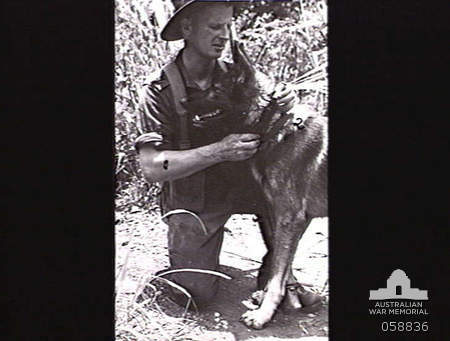 Sandy was trained by the US Dog Detachment for service in the Australian Army. Australian Private J.G. Worchester removes a message that Sandy has brought in his collar. This entry was posted in In the news, Vignette, World War II and tagged K-9 Corps, war dogs. Bookmark the permalink. I’ve always been fascinated with war dogs. K-9 dogs were trained at Fort Robinson, Nebraska, where I lived and worked in 1994. I believe some of the German POWs who were held at the fort also helped with the dogs. I believe the US has just passed legislation to allow the war dogs to be treated as veterans rather than as equipment. For example, retired war dogs living in the USA will be entitled to veterinary care. Excellent news! They deserve it. I know in my city, there is a memorial to war dogs in our Veterans’ Memorial Garden.